Frustrated and annoyed by the public opinions and descriptions of her father, Mark Twain’s daughter, 13-year-old Susy Clemens, decided that she would right the situation by writing her own biography of her father. 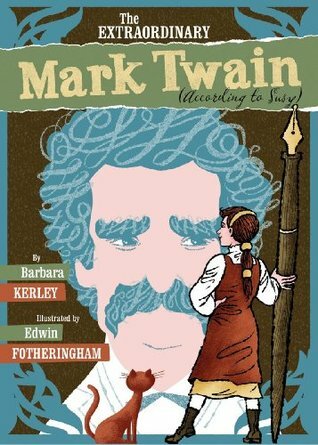 In this wonderful picture book Barbara Kerley offers some basic information about Mark Twain, but cleverly incorporates exerpts from Susy’s biography of Twain into her own text by way of smaller insert pages in the form of Susy’s journal. This book-within-a-book format is extremely effective in keeping Kerley’s voice separate and distinct from Susy’s. Susy’s words are immediately recognizable as those of a precocious young teenage girl. Her indignation over the misperceptions of her father, as well as her love and respect for him are also readily accessible in her own words. When Twain discovered his daughter was writing this biography he was both extremely touched and very proud. He was gratified that she wrote about both positive and negative qualities to her subject’s personality (his own). Sadly, Susy Clemens died suddenly of spinal meningitis at age 24 and never finished the biography of her father. Many years later Mark Twain always said that Susy’s biography of him was the finest compliment–and the one that meant the most to him–he had ever received in his life. This book does a terrific job of allowing us to learn about Mark Twain as a father–how he was with his family, as well as his daily demeanor and habits in a way that Susy–quite correctly–stated no one outside their family could discuss or describe accurately. If you are looking for chronological dates of Twain’s life and career this book will not provide them for you. It is, instead, a wonderfully insightful look into Mark Twain as a person, which is equally important when putting together a complete picture of a historical figure–especially one as monumentally important in American literature as Mark Twain. And so, people finally got just what Susy thought they needed: a portrait of the funny, serious, absent-minded, cat-loving, billiard-playing, philosophical Papa–the extraordinary Mark Twain, according to Susy.